ADCETRIS EC approval : The European Commission (EC) has expanded the approval of Takeda Pharmaceutical’s ADCETRIS (brentuximab vedotin) to cover treatment of previously untreated CD30+ Stage IV Hodgkin lymphoma in combination with AVD (Adriamycin, vinblastine and dacarbazine) in adult patients. ADCETRIS is an antibody-drug conjugate (ADC) that targets CD30, which is a defining marker of Hodgkin lymphoma. The latest ADCETRIS EC approval comes on the back of a positive opinion adopted by the Committee for Medicinal Products for Human Use (CHMP) in December 2018. The extended EC approval of ADCETRIS has been driven by the findings of the phase 3 ECHELON-1 trial which compared Takeda cancer drug plus AVD to ABVD (Adriamycin, bleomycin, vinblastine and dacarbazine) for the treatment of adults with previously untreated Hodgkin lymphoma. Takeda and Seattle Genetics secure ADCETRIS EC approval for CD30+ Stage IV Hodgkin lymphoma. Photo courtesy of Business Wire. The late-stage clinical trial met its primary endpoint – which was a statistically significant improvement in modified progression-free survival (PFS) compared to the ABVD arm, by registering a 23% reduction in the risk of progression, death or the necessity for additional anticancer therapy. Commenting on the latest ADCETRIS EC approval, Jesus Gomez-Navarro – Vice President, Head of Oncology Clinical Research and Development, Takeda Pharmaceutical, said: “We are pleased that the European Commission has approved ADCETRIS in combination with AVD, which has the potential to represent an important milestone for patients and serves as a testament to Takeda’s longstanding commitment to the Hodgkin lymphoma community. The latest ADCETRIS EC approval paves way for the marketing of the ADCETRIS AVD combination for the treatment of CD30+ Stage IV Hodgkin lymphoma in the 28 member states of the European Union and also in Norway, Liechtenstein and Iceland. Commenting on the new ADCETRIS EC approval, Anna Sureda – Head of the Hematology Department and Hematopoietic Stem Cell Transplant Programme, Institut Català d’Oncologia – Hospital Duran i Reynals, said: “The decision by the European Commission is a welcomed advancement for patients with previously untreated Stage IV Hodgkin lymphoma – a population that has not been offered a new treatment option in decades. ADCETRIS, which uses Seattle Genetics’ technology, is made up of an anti-CD30 monoclonal antibody attached by a protease-cleavable linker to monomethyl auristatin E (MMAE), a microtubule disrupting agent. The ADC uses a linker system that is engineered to be stable in the bloodstream but to release MMAE following internalization into CD30-positive tumor cells. Following the extended approval in Europe, Seattle Genetics will be issued a milestone payment of $30 million from Takeda Pharmaceutical. Clay Siegall – President and CEO of Seattle Genetics said: “Receipt of this milestone payment reflects continued progress by our partner Takeda to expand ADCETRIS approved indications globally. 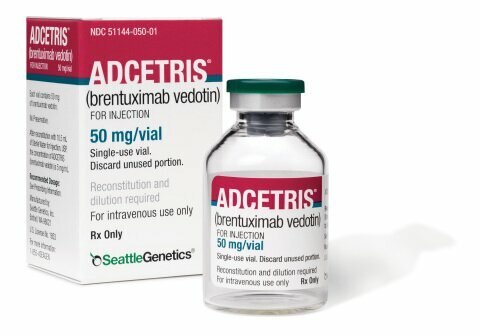 In November 2018, Seattle Genetics announced a new approval for ADCETRIS in the US in combination with CHP chemotherapy (cyclophosphamide, doxorubicin, prednisone) for the treatment of some types of peripheral T-cell lymphoma (PTCL). Read more about the Adcetris FDA approval news here.